Electrical strain gauge is a device which produces an electric signal whenever there is a strain on the object to which they are attached. In strain gauges electrical signal is produce due to the change in the resistance of the strain gauge. Strain gauges consist of single electrical wire which passes through strain gauge body as shown below. When strain is produce in any body the length of this wire of strain gauge is changed and a result the electric resistance of the strain gauge changes. This change in electric resistance is first amplified and then calculated to find the amount of strain produce in the object. In order to collect correct data from the experiment using stain gauge it is very important to know the place and the arrangement in which strain gauges must be placed on object. When it come to the place and arrangement of strain gauges then it depends on the types of strain gauge that where and how it will be placed during experimentation for effective data collection. Following are the three different types of strain gauges and how they are arranged to get results. Quarter bridge strain gauges have two different configurations for calculating bending and axial strain. In first configuration strain gauge is applied parallel to the principle direction of axial or bending strain. In second configuration two quarter bridge strain gauges are used in which one is applied parallel to the principle direction of axial or bending strain and other is applied perpendicular to the principle direction of axial or bending strain. Second configuration is done to compensate the temperature strain produce products. Half bridge strain gauges have two different configurations for calculating bending and axial strain. In first configuration is used for calculating the both axial and bending strain with temperature compensation. It has two half bridge strain gauges are used in which one is applied parallel to the principle direction of axial or bending strain and other is applied perpendicular to the principle direction of axial or bending strain. Second configuration is used to calculate bending stresses only but with good sensitivity it has two strain gauges and both are arranged parallel to the principle direction of bending strain but one is installed on upper surface and one is installed on bottom surface. Full bridge strain gauges have three different configurations for calculating bending and axial strain. In first configuration is used for calculating the bending strain only. It has two strain gauges and both are arranged parallel to the principle direction of bending strain but one is installed on upper surface and one is installed on bottom surface. Second configuration is used for calculating the bending strain only with temperature compensation. It has four strain gauges from which two are arranged parallel to the principle direction of bending strain (one is installed on upper surface and one is installed on bottom surface) and two are arranged perpendicular to the principle direction of bending strain (one is installed on upper surface and one is installed on bottom surface). 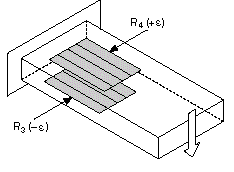 Third configuration is used for calculating the axial strain only with temperature compensation. 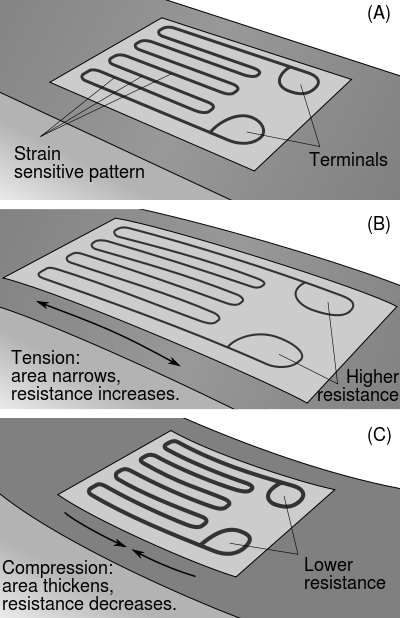 It has four strain gauges from which two are arranged parallel to the principle direction of bending strain (one is installed on upper surface and one is installed on bottom surface) and two are arranged perpendicular to the principle direction of bending strain (one is installed on upper surface and one is installed on bottom surface).